Upon school admission each student will create a graduation plan built with them and for them based on their transcripts and their career interests. Although daily attendance is expected from each student, at the time of registration each student and the school will create a realistic, workable attendance plan based on the students needs and obligations. Our elders teach us that school is so very important for success and that the bond between parents and children is vital and needs to be nourished, therefore once students become pregnant or have a baby they are encouraged to stay and school and bring their baby with them. We support parents at the school with babies up to 18 months old. 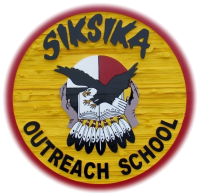 All students are partnered with a staff member when they are registered at Siksika Outreach School. Staff take extra care and concern for students under their leadership group to offer specific opportunities and supports that may benefit the student and meet their needs. Examples include, service learning opportunities, post secondary tours, leadership camps, potential funding, etc. Integrated case management forms are completed for each student and support plans and leadership opportunities are created for each student based on those forms. Most important and high needs issues are dealt with first. Graduation plans are also created with each student based on the students transcripts and career plans and show a clear map to graduation for each student. The Alberta curriculum and Program of studies offered at Siksika Outreach School is the same as offered in all Alberta schools. However, we deliver the program through individual module learning, instead of group lectures and group testing. This curriculum delivery allows for individual pacing, instruction and success. We offer hundreds of courses through module based learning. If you are interested in self directed and teacher supported learning please contact us. Both in house Elders and/or Siksika community Elders help us through the process of restorative justice when resolutions can not be achieved by other means.Through the restorative justice process we have the opportunity to emphasize healing, rather than punishment, and work toward healthy complete resolutions. We are thankful for the expertise of our Elders and the willingness of all parties involved to participate when we need to have hard conversations while dealing with complex and difficult issues. One of our goals at Siksika Outreach School is to give our students the opportunity to learn the value of serving others. We create many opportunities for our students to be able to do just that. Examples include serving elders at banquets, cleaning yards, painting fences, holding our annual preschool Christmas shopping, reading to preschoolers, etc. We offer character development for our students anchored by two foundational philosophies at the school; The Circle of Courage and Seven Teachings of our Ancestors. Using both philosophies we aim to create a sense of belonging for our students and offer enough support where students will be able to see their own achievements and be able to make a positive impact in their community and the world around them. Using horses, this course offers both leadership and character development for participants. Healing, reflection and therapy are also infused into the program. We are blessed to have a working partnership with the local health services and have access to counselling psychologists, therapists, social worker and elders to help meet the needs of our students. We offer career preparation courses which focus on career planning, creating portfolios, resumes, cover letters, etc. and junior achievement business courses which teach students how to start and run your own business using the students own ideas and products which they create and sell! Part of supporting young parents at the school is to offer traditional parenting class taught by Siksika elders so traditional values and wisdom may be passed down from generation to generation. Our wellness program is supported by any school grants we write and receive. Programs and projects focus on mental health, wellness and healing. Examples include; headstrong conference, equine therapy, art therapy, leadership projects and our upcoming greenhouse project (traditional plants and sacred tobacco). We are deeply grateful to have two in house elders involved in our program. We acknowledge the wisdom, guidance and support from our elders and the positive impact they have on our program. Siksika Outreach school offers post secondary planning in a variety of ways. Support may include; tours of post secondary institutions, post secondary presentations at our school, working with students on career planning sites or inventory testing. Perhaps of more value, we offer support in completing applications for schools, child care, house rental applications, transportation logistics, funding applications and the cost of many of same. Community partnerships are a vital part of our success. We are a small staff and are very grateful for many community partnerships that share their expertise with us to help our students meet both their academic and personal goals. We are blessed with such support! One of the advantages of individual programming is that we can review individual student transcripts to see if credit recovery is a possibility. This practice allows schools to give credit where a student has been successful and repeat areas where they have not been successful instead of having the student repeat the entire course. This practice could include having the student upgrade their classroom mark of any subject, rewrite a diploma exam, upgrading portions of a course or challenging courses. We are proud to offer diploma prep sessions for all students writing diploma exams for any diploma courses. We encourage all grade 12 students to participate. Our participation rate is approximately 96%. All students participating in diploma prep sessions have passed their diploma course. We have even had some grade 11 students participate in the prep sessions so they feel more prepared for the following year when they have to take diploma exams in grade 12! We use the following opportunities to support students finding careers; career investigation reports, inventory testing (finding a career a student may be proficient at), career websites like alis.ca, etc. We help students find their passions and strengths and match them with possible careers.